The egg waffle shaped like an egg, in Chinese it’s called 雞蛋仔 (literally means little eggs), one of the long standing popular street foods in Hong Kong. It’s one of my favourite childhood foods. I remember that I ate a whole packet after school nearly every weekday. After moving to Australia, I miss this delicious snack very much, yet hardly tried to make any at home, simply because I don’t have the mould specially designed for making this snack. After posting the recipe of waffle (Hong Kong Style), many readers sent me emails asking for the recipe of 雞蛋仔. My dear readers you get it now after a long wait. 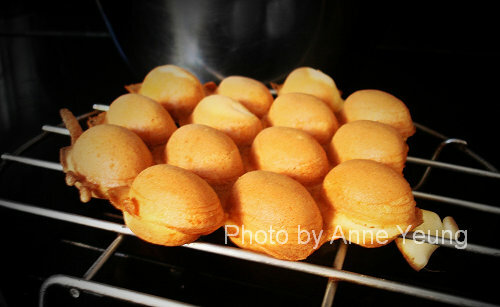 One of my fans of my Chinese food blog, Anne Yeung wrote a guest post sharing her recipe. Anne and I share the same love of this unique Hong Kong hawker food. Many thanks for her time and generous sharing. The Hong Kong style Egg Waffle is a unique street hawker food in Hong Kong. Piece by piece they come in a golden coloured honeycomb shape and gives out a rich aroma of cake flavour. It is in fact hollow in shape … it gives one an extraordinary experience when biting on it as it has a distinct texture of having a crispy shell with inner softness. In accordance to information available, the Hong Kong Style Egg Waffle is originated in the 1950s. In an effort of making use of some cracked eggs, an Asian grocery shop’s owner made an attempt of developing this egg batter. Sugar, flour and evaporated milk were added to an egg batter and was poured into a honey-comb metal plate to cook into waffle. Traditionally, the Hong Kong Egg Waffles are made over charcoal flames. However, most people nowadays use electric stove tops due to cost efficiency and safety reasons. (Information gathered from https://zh.wikipedia.org/zh/雞蛋仔). Nowadays, the Hong Kong Style Egg Waffle has its original formula improved to also come in an array of different flavours and they include chocolate, strawberry; original flavour with shredded coconuts, black sesame, etc. However, the original flavour still remains as the majority out of all. I can never forget about that special bond I had with the Hong Kong Style Egg Waffles … perhaps I should have said I am reluctant to have forgotten about it, probably due to the fact that the deep rich egg aroma has concealed within it my personal growing up memories in Hong Kong. My son is already the generation which is born overseas … it is not possible for him to fully understand that feeling that I have with the Hong Kong Egg Waffle. But what a mother can do is to learn making so at home, at least to give that tiny little chance to my next generation the opportunity of tasting that rich egg aroma over the other side of the world. Firstly mix and sieve the plain flour + baking powder + custard powder + topica starch. Set aside. Beat the eggs and mix in the white sugar using a wooden stirrer. Add in gradually the evaporated milk and still water. Mix thoroughly. Add the sieved flour mixture (1.) into the egg mixture (2). Stir thoroughly until a smooth batter is form. It is important that it forms no lumps. Add in the vanilla essence and mix well. Finally add in the vegetable oil. Cover the batter with cling wrap and refrigerate for at least an hour. 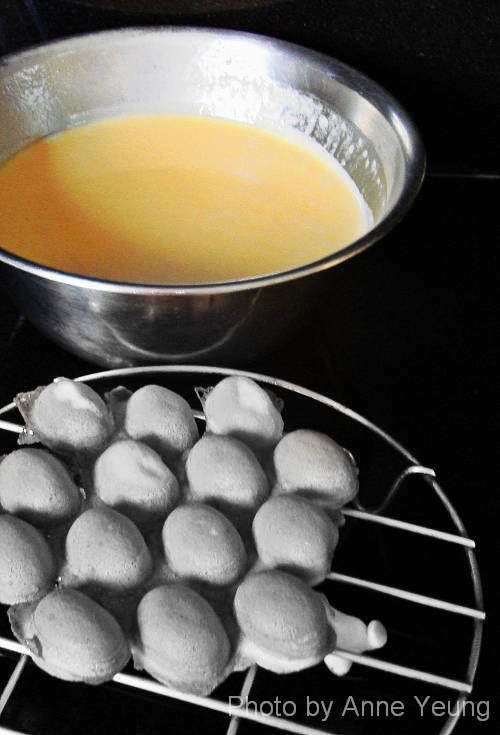 Take the egg batter out from the fridge half an hour prior to using; allowing it to return to room temperature. Warm up each side of the mould, and brush a thin layer of oil on each side. Pour the egg battle into a large measuring cup for ease in pouring so onto the mould. Pour the egg battle onto the mould filling upto 80% full. Close the mould and hold the handle firm to keep the two sides closing tight. Then flip and turn the closed mould in order to have the egg batter filled evenly inside the mould. Flip to the opposite side of the mould and place it on top of the stove. Use medium heat to cook each side for 1 to 2 minutes until the egg waffle is cooked and can thus be easily removed from the mould. Use a fork to remove the egg waffle from the mould and place it on a cake cooling rack to cool. Repeat steps 8 to 11 until all egg batter is finished. The newly purchased mould will need to be thoroughly washed and cleaned prior to first time use. Then warm up the mould on heat, and follow the cooking steps (as above) to make initial egg waffle. The egg waffle can be discarded and the same procedure needs to be repeated for 2 to 3 times until the egg waffles start to be relatively easier to be removed from the mould. Refrigerating the egg batter for an hour helps to make an easier job of cooking a perfect egg waffle relatively easier. The egg waffle should be left to cool for a little while before consuming to gain its crispness. If ladies do feel that holding the mould is far too tiring over a period of time, they can perhaps get the gentlemen at home to take turns and give them a helping hand. I attempted making this so many times and lost count on the failures resulted before getting on hold this recipe and the techniques involved. So don’t give up and all the best! If you're living overseas, you might check this egg waffle pan out on Amazon. yumm! Too bad I have no idea of where to get these moulds outside Hongkong! They are such cute egg-shaped cakes! I have never eaten these before. I don't know if they are sold in singapore. This is one of our favourites when we visit Hong Kong every June. Some night markets in Singapore are already selling this. They are so cute!! I used to eat them whenever I visit Hong Kong. It's been a long time since I last visited Hong Kong. Time to make another trip. Great idea. If I go back to HK, I'd like to meet up with you. I've always wanted to make egg waffles! I've got stacks of recipes from magazine cut outs over the years, but I've never gotten a mould because it's just too heavy to carry from HK to Australia =( These look delicious!! Geez...I don't think I have eaten them in Hong Kong. Now I need to....remember. oh my god!!! When I went to hong kong the past few years I fell in love with these waffles. I bought a mold and collected recipes from several sources and failed many many times. I finally ALMOST got it right recently (after seasoning my pan) but not quite there yet! excited to try your recipe! If my memory serves me correctly, this egg waffle has been selected by one of media here as one of H.K. 's top 10 signature foods. Come Christine, back to HK, experience this lovely snack again right beside a hawker stall. Tell me if you would like to share it with somebody : ). These are so cute! I need to refrain myself from getting new equipement. So I can only read and drool. I love these waffles, what a treat. thanks for sharing. Just wondering if the recipes would work if I use muffin tins or the standard waffle machine? The taste remains the same, but I'm afraid the texture and look would be changed a lot. Will I be able to mix all the ingredients together and leave it overnight.It it has the same effect as just putting it in the fridge for an hour. Also can I put less sugar? Sorry for asking so many questions.I love your website, thanks Keep up the good work and provide us with more recipes. The recipe works overnight too as it remains the same good the following day. As this recipe contains no preservatives, I suggest that the batter to be consumed within 1 day or 2. Yes, the sugar level can be adjusted to suit one's taste accordingly and it will not change the texture. I have no tapioca starch, so I was thinking about substituting cornstarch or corn flour. Do they have a weight difference? Or can I somehow convert grams into tablespoons? I love this website, thanks for posting the recipe! Any supermarkets would stock custard powder. Cant believe you have the recipe on here! Its one my fave foods, and everytime I go back to HK (I left when i was 6 yrs old) i have to have it. It helps that I stay at North Point with my grandparents and one of the most famous egg waffle places is just around the corner. They always have lines going around the corner! crazy! Thanks for posting this! what kind of stove are you using? can you use an electric stove? @Anonymous hi i was wondering how much it the mold is?? and where are oyu sending it from? Williams-Sonoma has them in their February catalog. Call your nearest store to check the stock! Can you provide in ounces instead of grams or ml, please? Sorry, this recipe was written by my fan. But you can google the conversion, like this one. If in San Francisco, one can get them freshly made at Eggettes. 3 locations in So. SF. I've also seen custard powder at Cost Plus if you're on the West coast. What kind of topica strarchare you using cause there a lot of different kind in the chinese super market? Sorry, can't answer you, because these egg waffles were done by my fan, Anne Yeung. 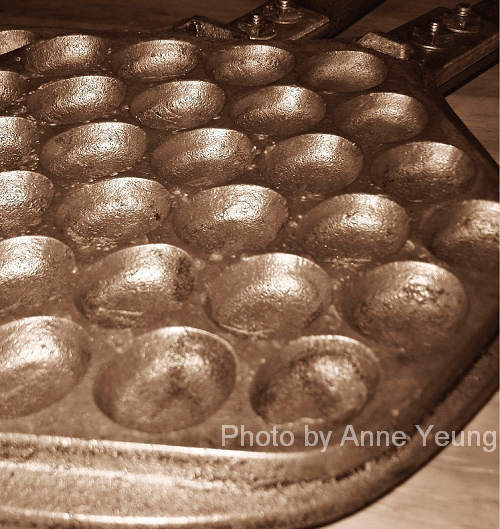 The mould resembles an ebelskiver pan. An ebelskiver pan is easy to find in the U.S.A. I've used Bird's Custard for custard powder. Thanks for the recipe. I will definitely try it. It brings back childhood memories that were sweet and exciting. I have been telling my husband about street snack for the last 20 some years and how I miss them. Does any one know a recipe of these Waffles without EGG? Would they taste still same ..? How do I get those 雞蛋仔 crispy? Thanks for the great recipe!! For those people that don't have the egg mold just make do with a waffle maker. You can buy a small one for less than $20. Looks so yummy and i am really interested to try make it. Don't have the mold and wonder if this work if i use takoyaki pan? Thanks so much for this recipe base! I've adapted it to great success and am enjoying eggettes again after a decade of missing them! Fascinated by your posts on how you re-created the authentic taste of your fave “gai daan jai“. Thanks for the shout-out too ! I feel like the taste is not rich enough.. should I put more eggs or vanilla essence? This recipe was submitted by my fan. I didn't try it, but I think you can tweak it with more eggs to your liking. Hi everyone! I'm going to Hong Kong for a week! Does anyone know where I can buy this in HK? Actually, is it really heavy, and about how much is it? I want to buy it but if it's super heavy then I don't know! I use a non-Contact infrared thermometer to check the pan temperture. I get the best results when I heat both pans to about 425 degree F. and cook for about 2 mins. on each side. I have a mold and filled them with melted chocolate. Works fine. Same thing, chocolate style.